by Victoria Casal-Data in Reviews, Second Language Acq. Foreign Language students, especially those learning English in the United States, depend on quality and authentic input to survive and communicate in their new environment. It is imperative to give beginners, for example, the ability to say a simple ‘hello,’ or to efficiently communicate in an interview or at a meeting. For higher-level students, it is also important to foster a sense of global culture, prime them to have the ability to carry on conversations and be knowledgeable, in L2, of local cultural and global issues. With these small, relevant ­presentations, students will be able to analyze language at sentence level while practicing their listening skills with something other than simple dialogue. Watching the speakers talk may also benefit from hearing and seeing other linguistic and paralinguistic features such as anecdotes or body language. This speech/vocabulary building exercise will consist of listening to a TED talk and relating that talk to a few key vocabulary words. I’ll engage them by sharing relevant yet devastating statistics regarding poverty in Africa. I’ll ask them if they’ve ever experienced poverty (might not get many participants, but I’ll ask and share myself). Ask them if they could think of any creative solutions to resolve this world crisis. Then, I’ll introduce them to the TED talk we are going to watch and give some background information. I will then hand out worksheet with instructions; I will read them out loud and then, I’ll play the TEDtalk on the class screen. A. (Directions for students) As you watch carefully, listen for the words below. Try your best to write down your own definition based on the words and meanings before and after the target vocabulary word in Bono’s talk. b. After the talk, reflect on what the speaker said about poverty and change. Do you agree with what he said? Write down any other thoughts you may have had while watching the video. Discuss dictionary definitions of these word; review sentences from TEDtalk with vocabulary words in them. The above job advertisement is one of far too many that exhibit “that discriminatory practices in hiring English language teachers based on native language continue” (Levis, 2016, p. 3). In the English Language Teaching (ELT) community there are two types of teachers: the NEST (Native English Speaking Teacher) and the NNEST (Non­native Speaking Teacher). According to research (e.g. Selvi, 2010; Ruecker & Ives, 2014; Mahboob & Golden, 2013), approximately 75% of all job ads published online are for NESTs only. The example above was taken from a cluster of job postings created by ESL Suite Consulting, a staffing and recruiting firm based in China who, on their LinkedIn business page, claims to “connect qualified teaching candidates from around the world to reputable ESL schools in China (LinkedIn, 2013).” The problem we have with these types of ads stems from, firstly, the language usage. This ad asks for whatever they may deem a “qualified teacher of English”; and secondly, their interest in verifying a candidate’s race and ethnicity by requiring the applicants to be from certain countries, and in extension, show proof of such by sending in a copy of a valid passport and a recent photograph. It comes to no surprise that in certain countries (e.g. South Korea), NES status is further ‘refined’ to being white and Western­looking. ESL Suite’s requests not only deny most if not all NNESTs, but they also reinforce the negative discourse that works around the ESL community regarding notions of an English teacher’s authenticity via cultural, linguistic, and racial affiliation, and levels of native­speakerism. In his paper Linguistic Imperialism, Robert Phillipson (1992) argues that native English speakers’ culture and thought processes are based on “a dominant Centre (the powerful Western countries and interests) and dominated Peripheries (the underdeveloped countries)” along with “linguicism, [which] consists of ‘ideologies, structures, and practice which are used to legitimate, effectuate, and reproduce an unequal division of power and resources... between groups which are defined on the basis of language’” (p.57 ). In this case, Western English becomes the ‘apparent’ driving force for economic and social development, making educational institutions outside of Western countries (as well as non­Western students) to preferably implement and follow a Westernized curriculum taught by Western NESTs that exude Western perspectives and accents. Linguistic imperialism is a primary component of cultural and social imperialism, and like racism, linguicism may be conscious or unconscious on the part of the actors, as well as overt or covert. It may be of an abstract kind such as regulations for the use of particular languages, or more concrete such as resource allocation to one language group but not others (Phillipson, 1992, p. 55). Medgyes’ (1992) argument that “NESTs and non­NESTs use English differently and, therefore, teach English differently” is a valid one (p. 346). Qualified NNESTs and NESTs are not all the same, and they do bring diverse expertise to a language institute or local grade school. However, as a diverse group of English teachers ourselves, we believe that treating the two groups as if they were completely separate entities leads to added discriminatory hiring practices that should not exist. After all, both certified NESTs and NNESTs undergo pedagogical training and language­teaching skills that prepare them to teach successfully no matter their linguistic or racial backgrounds. And even if “the routes used by the two groups are not the same” (Medgyes, 1991), they each should be given equal opportunity. Here, we agree with Phillipson in that “teachers are made rather than born” (Phillipson, 1992, p.14). With this paper, we aim to compile a relevant set of literature that helps define and theoretically ground the many unjust reasons why NESTs are preferred over NNESTs and to then offer some solutions and further research questions regarding this problem. We start by defining the issues of race and nationality within the ELT community; then, we go into the notion of a ‘qualified’ English teacher based on ideas of authenticity and native speakerisms, and finally, we discuss some ‘for and against’ arguments regarding the hiring of NESTs over NNESTs. At the end of this article, we offer a discussion in which we reflect upon the topic of discriminatory hiring practices. We conclude with suggestions for further action that can be taken to contribute to the fight for equality amongst language teachers worldwide. Race refers to a group of people who possess similar but distinct physical characteristics. It can also be defined by the bloodline. On the other hand, nationality pertains to the country of citizenship, meaning it generally refers to where a person was born and holds citizenship. It can be interpreted by borders, culture, tradition, and language. When comparing the two, “nationality” has a broader meaning. On the contrary, persons who value only race are narrow­minded. This paper explores race and nationality in a more narrowed scope, specifically regarding the positions and situations which NESTs are facing in the field of English language teaching. Voices are rising as people are demanding that NESTs and NNESTs be treated equally, yet in many countries, there is a general social and commercial preference for NESTs, which may also involve racial issues instead of a mere preference for native teachers. In Watson and Punjaporn’s (2008) “Implicit attitudes towards native and non­native speaker teachers”, the Implicit Association Test was applied to investigate the implicit attitudes of Thai students towards native and non­native English speaker teachers. According to their study, for explicit attitudes, subjects prefer NESTs to NNESTs, but feel warmer towards NNESTs. Students showed no difference in their implicit attitudes between NESTs and NNESTs. Generally speaking, neither explicit nor implicit attitudes were influenced by whether subjects had had previous learning experiences with NESTs, and explicit attitudes were not related to implicit attitudes. The biggest strength of NESTs was identified as teaching pronunciation, whereas NNESTs were perceived to be strong in learning strategies. However, for the commercial preference of NESTs, there is still an across­the­board social acceptance of the native speaker model. When students are given a chance to choose from those two options, they usually tend to choose NESTs. More evidence can be found on the examination of letters in newspapers and on Internet discussion boards of this topic. A lot of the ads in many Asian and Middle­east countries for hiring teachers that ask for a native speaker really mean “Asians need not apply. If you look like a Westerner (i.e. you are white) you’ll often be accepted as a native speaker even if you’re German, Dutch, etc.” (p. 25). Mahboob’s (2009) “Racism in the ELT industry,” examined the phenomenon of hiring the White NESTs specifically associated with the UK, Canada, the USA or Australia as a preference in the ELT industry. Mahboob (2009) also pointed out that “even in ELT institutions that hire non­native speakers, there is a majority of White non­native teachers” (p. 37). An example from Mahboob’s (2009) research which is worth taking some time to reflect and ponder upon states, “Asian­Canadian woman who wants to find out what her chances are of getting a job in the Middle East” asks a question about how she would be treated based upon her appearance (p.30). The first response to her question told her that she might soon become dismayed by attitudes of fellow Western expats since “almost all of the top TESL jobs in the UAE recruitment decisions are taken by Western expats” (Mahboob, 2009, p.31). The second response confirmed the prejudice in the choosing process of candidates by stating that the job recruiters would prefer “a white Brit with mediocre experience and qualifications” instead of a “non­white native­speaker of English with excellent qualifications and extensive experience” (Mahboob, 2009, p. 31). This discussion shows that being White is considered to be the most privileged credential by the discussants in the above example. Yet, another shocking online advertisement that specifies that employers are looking for an English language teacher who is “white and not too old” caught our attention (Mahboob, 2009, p. 31). In addition to the issue of racism, the advertisement also raised the issue of ageism. All of these quotes indicate the prejudice in ELT for desired Whiteness and native speakerism. The survey of adult English as an Additional Language (EAL) programs in the United States does not show a very promising outlook for us either. The study showed that a person’s status as a ‘native speaker’ can make a huge difference on whether they will be hired or not. In Mahboob’s (2009) conclusion he mentioned that the future of English is that of an intralanguage, hence the native speaker of English may be less and less relevant as a model for language teaching and learning. What does it mean to be ‘authentic’ in the ELT world anyway? There are many ways to define authenticity in the realm of existential philosophy. But to most of us, authenticity is tied to an absolute truth of self; in other words, authenticity “equates to the measurable amount an individual can be their true self ” (Lowe and Pinner, p. 31). There is a great emphasis on notions of individual truth when we think about authenticity. But what happens when being authentic is attached to a larger, dominant world ideology? Authenticity, as it relates to the issue at hand, is conceptualized as the way in which an individual relates to the institution in which they teach, the way they teach, and what materials they use to teach, in this case, English as a second language in a globalized world run by Western ideals. There is this interesting quandary when we look at authenticity from an individual perspective in relation to a larger more systemic authenticity. How English teachers end up falling into the authentic category does not rely on effective teaching methodologies, or capability to empathize with students learning a second language, better yet, it is strictly grounded on how well they fit into the Western canon. Issues of legitimacy often arise if teachers are not completely categorized as authentic under these implicit, cultural rules and regulations that marginalize non­Western cultures and accents. Holliday (2003, 2005) coined the term ‘native­speakerism;’ the term seeks to deal with the issues of culture and politics in the ELT community in a more overarching way by including discussion of culturism and orientalism. The term measures the degrees of an English teacher’s Western authenticity. In other words, hiring institutions look to find Western accents, Western­looking features, and Westernized methodologies of teaching. Later, Houghton and Rivers (2013) made a persuasive attempt to redefine the term “native speakerism” as one that presented ideas of “prejudice, stereotyping, and/or discrimination, typically by or against foreign language teachers, on the basis of either being or not being perceived and categorized as native speakers of a particular language” (p.14). Ideas of authenticity and native­speakerism come together, conceptually, to further define few core issues regarding discrimination in ELT hiring practices. Given the meaning of authenticity in the realm of ELT, Lowe and Pinner (2016) view this preference for NESTs over NNESTs teachers as an issue that stems from a hegemonic linguistic and cultural discourse that is deeply embedded in the ELT community (English learners and NNESTs teachers included); a discourse that does not align with what Vertrovec (2007) calls, the ‘super­diversity’ phenomenon. It is certain that there is a link to be made between the notions of authority and authenticity here; there is no doubt that it is deeply concerned with power relations. There is certainly an overarching culturalist mindset in the ELT community. According to Lowe and Pinner (2016), “the representation of non­Western cultures in the ELT community has been noted as being problematic for the very fact that it defines these cultures in monolithic ways which fail to represent diversity” (p.35). Canagarajah (1999), argues that “dominant cultural groups are always involved in building consent to their power by influencing the culture and knowledge of subordinate groups” (p.31). The latter supports the fact that ESL teacher materials, training courses, and reference books “tend to showcase a taxonomy of differences between familiar and exotic cultures” (Guest 2002, p. 154) which further reinforce a culturist perspective. This adds to the idea that NNESTs’ authenticity in the ELT world is dictated by how well they ‘assimilate’ to the content they are teaching, and how well they emulate Western accents, if possible. Lowe and Pinner (2016) find that authenticity and native speakerism are also connected in terms of cultural capital. Cultural capital, as defined by Bourdieu (1991), is the body of non­financial assets that can help individuals move up on the social ladder. An English learner emulating the Western English accent, for example, is seen as a venerable attempt at elevating their socio­economic status and reaching global citizenship. An excellent example of this is when we “consider the practice of students going to universities in countries where English is the official language (or de facto official language), such as the USA or UK” (Lowe and Pinner, 2016, p.36). Students seeking to teach English as a second language also congregate at American or British universities; though they are not here to learn the language but rather, how to teach it by way of a Westernized methodology in order to “gain social capital in the form of connections to, and relationships with, people and institutions through which they may be able to socially and materially benefit (p.37). Authenticity as an English teacher, then, becomes this quest to gain and spread authoritative discourse instead of teaching English as a non­native speaker, in order words, teaching a non­Westernized English. Teachers wish to be as authentic as possible and present as authentic material as possible to their students, while students also desire and expect authentic input combined with authentic learning materials. As reported by Levis (2016) who cites research from Kirkpatrick (2006), Mahboob (2010), and Shin (2008), “Hiring practices around the world show a preference for NESTs... because of claims that learners want to be taught by NESTs (Clark & Paran, 2007)” (p. 3). Despite the fact that most of the participants in Levis’ (2016) study, and probably arguably a majority of language learners in general, displayed a preference for authentic native teachers, after both the experimental group of nonnative teachers and control group of native teachers each taught separate pronunciation classes for a period of seven weeks, both groups of students showed similar levels of improvement, neither having a noticeably higher statistical significance. This research reveals that as long as a teacher has the appropriate level of knowledge and skills in whatever aspect of language he/she is teaching, he/she can be still be an effective teacher of the English language in particular, regardless of questions of authenticity as an English speaker due to first language origin, even in the realm of pronunciation. There has been statistically significant evidence for the effectiveness of teaching pronunciation. For example, Levis (2016) cites Saito’s (2012) research in which 13 out of 15 studies reported student improvement of pronunciation following instruction. When it comes to teaching pronunciation in specific, but English in general, there are, of course, some benefits that NESTs have over NNESTs, and vice versa. NESTs have the native speaker insight which NNESTs do not, but NNESTs have an insight into the obstacles a student might encounter when learning the language as well as how to overcome any such obstacles. Although there has been support for the superior fluency of NESTs in teaching pronunciation and of NNESTs in terms of learning strategies (Watson & Punjaporn, 2008), since the NNESTs are reported to have better teaching methods, they could arguably be better teachers of pronunciation even though they may not be able to fully or fluently pronounce the English language sounds like a NEST could. Part of the reason for NNESTs not being taken as seriously as NESTs in terms of their professionalism in the ELT field is due to an opinionated belief that is unsupported by actual research. Today, English is used more by non­native speakers, either as a second or foreign language, to communicate among themselves than by non­native speakers to communicate with native speakers (Walkinshaw & Oanh, 2014). With the rapid spread of English as a lingua franca, the number of NNESTs has outgrown that of NESTs (Widdowson, 1994; Crystal, 1995; Graddol, 1997, as reported by Arva & Medgyes, 2000). Some linguists dislike the NEST­NNEST distinction, and would rather refer to native and non­native teachers in the ELT field in ways that highlight the “’WE­ness’ instead of the ‘us’/‘them’ division (Kachrut, 1992, as cited by Arva & Medgyes, 2000, p. 356), such as “more or less accomplished users of English” (Edge, 1998, as cited by Arva & Medgyes, 2000, p. 356). Differences between NESTs and NNESTs lie on their language and their teaching behavior, the latter being determined by their language proficiency, language background, qualifications, and relevant teaching experience (Arva & Medgyes, 2000). Both groups of teachers can be equally good teachers in their own terms. There are significant differences between NESTs and NNESTs. “This is not to say, however, that either group was better regarding teaching qualities. ‘Different does not imply better or worse, and this being the case, teachers should be hired solely on the basis of their professional virtue, regardless of their language background. '” (Medgyes, 1994, as cited by Arva & Medgyes, 2000, p. 358). NNESTs are often compared with NESTs. In many countries, native speakers are believed to be ideal English teachers, and non­native speakers are considered to be inferior language teachers. This belief, labeled the “native speaker fallacy” by Phillipson (1992), has affected NNESTs’ self­image and confidence, and it has impacted in their teaching (Ma, 2012). “English language teachers are evaluated by their first language rather than by their teaching experiences, professional preparation, and linguistic expertise” (Ma, 2012, p. 2). Native language does not by itself make a good English language teacher. Non­native teachers of English bring certain assets with them to the English language learning situation which are worth noting. For this reason, NNESTs’ self­perceptions have been investigated in the last two decades. This section of the review describes the findings of studies in relation to NESTs and NNESTs’ strengths and weaknesses. Two of these studies were conducted in secondary schools: one in Hungary (Arva & Medgyes, 2000) and another one in Hong Kong (Ma, 2012). The study in Budapest, Hungary, consisted of ten video­recorded lessons taught by NESTs and NNESTS and ten interviews with those teachers. In his 1994 study, Medgyes included the findings from three surveys whose participants were teachers representing eleven different countries. In Hong Kong, the research was done through a teacher questionnaire that collected teacher background information from NNESTs, and open­ended questions and semi­structured interviews that requested those teachers’ views on strengths and weaknesses of both NESTs and NNESTs. A third study, conducted in Vietnam and Japan (Walkinshaw & Oanh, 2014), focused on university students’ perceptions of NESTs and NNESTs. The results of the research are presented below as strengths and weaknesses for each group of teachers. The consensus revealed that NESTs were linguistically superior. They were found to be more competent in their spontaneous use of the language in diverse communicative situations. They are considered more knowledgeable in terms of colloquial expressions, idioms, and phrasal verbs. They can also provide valuable cultural information to their students. Due to their oral linguistic abilities, they are mostly assigned to conversation classes, in which they create an environment of rich oral interaction. They are useful linguistic resources not only for students but for the other teachers as well. NESTs were found to lack knowledge of the grammar of the English language. Therefore, although they can tell what is wrong and what is right, they often cannot explain why. NESTs were also reported to lack knowledge of students’ first language, which prevents them from interpreting the mistakes students make and understanding the difficulties that students encounter as they learn English. NESTs were perceived as not being familiar with students’ educational culture, such as calling on reluctant students, which in some cases causes some tension in the relationship with their students. NESTs were reported as making more pedagogical errors. For example, in the video­recorded lessons, “some activities were launched and never finished, the teacher spent an unduly time with a particular group at the expense of others, and some discussions dragged on endlessly” (Arva & Medgyes, 2000, p. 366). NESTs’ level of empathy is said to be lower because many NESTs do not go through the process of learning a foreign language themselves, since most people speak their language (Ma, 2012). 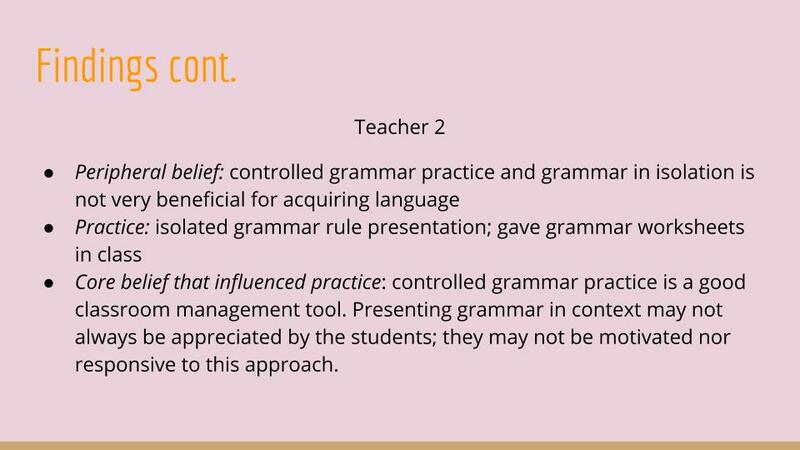 NNESTs were perceived as good teachers of grammar due to their deep knowledge of English grammar and their metacognitive awareness. As successful English language learners themselves, NNESTs possess a high level of empathy, since they are cognizant of what the students go through when they learn English. In the contexts where the teacher and the students share the same linguistic background, the teacher can anticipate the kinds of mistakes that the students are likely to make. NNESTs were reported as being able to communicate more effectively than NESTs with students who have low English language abilities. In the foreign language settings, their familiarity with the local educational system and examination requirements makes them better prepared to help those students succeed on examinations. Another advantage assigned to NNESTs was their pedagogical competence. Their English proficiency level is not considered as high as that of NESTs’, especially in pronunciation, vocabulary, and colloquial expressions. In some instances, NNESTs’ language was described as “bookish” and outdated. Less familiarity than NESTs with the culture of the target language did not allow students to significantly increase their knowledge of the English speaking countries. There was a discrepancy in these studies in terms of the teacher’s ability to code­switch to the student’s first language in the classroom. Some teachers and students considered it a strength, especially at the lower levels of English proficiency, since it enhanced teacher­student communication, and some considered it a weakness, since it lowered students’ motivation to use the target language. The use of the first language in the classroom is still debated. Ma (2012) states that “NNESTs and NESTs have different linguistic, socio­cultural, and pedagogical strengths and weaknesses, and therefore, they should not be compared purely on linguistic grounds” (p. 2). She summarizes the advantages and disadvantages of NESTs and NNESTs through the quote “the native speaker teacher is in a better position to know what is appropriate in terms of language use. (...) But it is the non­native­speaker teacher who is in a better position to know what is appropriate in the contexts of language learning” (Widdowson, 1992, as cited in Ma, 2012, p. 2). Since both groups of teachers present skills that complement each other, Ma (2012) believes that students learning English should be exposed to both, NESTs and NNESTs. She also suggests that, as both groups of teachers present strengths and weaknesses, “they should continue to work on their strengths and minimize their weaknesses. In this way, both can make valuable contributions in the field of TESOL in their own terms” (p. 12). Historically, socially acceptable explicit attitudes towards race in the West have changed substantially over the last fifty years. However, to change social attitudes in Thailand— as discussed in Watson and Punjaporn (2008)— and similar countries so that explicit statements of preference for white NESTs, or any NESTs for that matter, become socially unacceptable, we still have a long way to go. Nevertheless, the discriminations in the ELT industry remains a frustrating reality. All teachers should be judged as individuals rather than as representatives of potentially prejudicial categories. Although the future of equality in the ELT community is still to be seen, it is important that we recognize the need for the most effective language teaching and learning environments to be created in order to foster the far­reaching capacity and possibilities granted by English being used as a global language or intralanguage. If we extrapolate this data, which is focused on pronunciation, to overall English language teaching instead, once we realize these factors and we can recognize them off hand, we can address them when the moment is most crucial and do our best to combat any issues that may arise based on skewed beliefs about the reported attributes above. While this task may seem somewhat daunting at first, such information can lead us towards a hope for a more equal future for NNESTs. By identifying the issues at hand, the more research and education provided to language teachers, students, and policymakers alike, the more likely we are to begin eradicating this issue of injustice. Just because a teacher may not be a good example of a desirable, model accent or appearance, does not mean that he/she is devoid of pedagogical skills. This bias is based upon unsturdy foundational beliefs. NNESTs can be just as effective teachers as NESTs, and possibly even better. A teacher who is non­native, with the proper training and experience, is anything but incapable of effectively teaching a language. Whether using the “proper” pronunciation of said desirable accent, whatever that may be deemed to be, or even creating a new identity with their own personalized way of speaking in the new language, the teacher must speak in a way which is easily comprehensible at the very least and may even contain its own specific flares. As long as a teacher is understandable, well­trained, and knowledgeable in all aspects of language teaching—from classroom management to using the most proven teaching methodologies to having an in­depth knowledge of the linguistic elements and how the linguistic elements of the native language compare and contrast with the linguistic elements of the target language—effective learning can still take place. Other similar experiments as described in Levis’ (2016) study—in which the effectiveness of NNESTs’ teaching pronunciation is measured against and stacked up to the teaching of pronunciation by NESTs, as well as other aspects of the English language, in addition—should be carried out in target languages other than English. It must be acknowledged that more research must be done on the results of non­native teachers’, who come from different language backgrounds, pronunciation courses in terms of the relative improvement experienced by students, who may also come from different first­language backgrounds. Thereafter, all results from as many different language backgrounds as possible, on both the teacher and student side, should be cross­referenced, compared, and contrasted. As Levis (2016) reports from Foote, Holtby, & Derwing (2011), “teachers often do not address pronunciation adequately because of lack of training” (p. 2). If, however, we could train ourselves, as educators and specifically as language teachers, not just in terms of pronunciation, to be as well­rounded and eclectic as possible in terms of teaching methods, as well as comparative and contrastive knowledge between the target language elements of English and those of each home language of the students, we would set ourselves and our students up for success in the language classroom. Just as with many other types of social injustices, the issue of NEST of NNEST preference is based at least partially upon ignorance and lack of adequate knowledge on the subject. With all of the research presented in the current paper, some light may finally be shed upon the dark corner that houses the NNESTs in the English as a Second Language (ESL) and English as a Foreign Language (EFL) universe, even in the darkest reaches of the realm of pronunciation teaching. Once the knowledge spreads, NNESTs themselves, along with their students, will finally be able to feel more comfortable and assured that they could effectively teach, and be taught, any aspect of the English language as competently as, or even more competently and dynamically than, NESTs. Once a majority of the ESL and EFL teachers and students realize the research­based, albeit still arguable, equity between NESTs and NNESTs, the confidence in NNESTs will rise upwards through the chain of command to the policy makers, who can then implement true systemic changes; that is, if and only if the call for change becomes overwhelmingly undeniable enough. Although complete change may still be a long way off, we have begun taking steps in the right direction. Relating back to job positions like the one presenting at the beginning of this paper, literally giving strict priority to NESTs only from the 4 countries listed at the introduction of the current article as reported from Mahboob (2009), it is clear that NESTs have an advantage at job placement in the field at the current time which must be addressed, or at least backed by research if it should persist to exist. Levis (2016) has given NNESTs some hope as empirical data is presented which tells us that our long­held beliefs are to be questioned and even possibly discarded in the, hopefully, near future. As was mentioned earlier in this paper, the “native­speaker fallacy” (Phillipson, 1992, p. 185)— which set the NES as the ideal teacher of English, encouraged the hiring of only NNES for teaching positions, and even led many NNES “to question their own professional legitimacy” (Kamhi­Stein, 2016, p. 181)— generated great discontent among the NNES professionals. As a consequence, in the mid-1990’s, a movement emerged in the TESOL International Association to advocate not only for NNESTs’ rights in the English teaching field but also in order to raise NNESTs’ status within the Association. After a NNEST Caucus was established, in 1998, with the purpose of creating equal professional opportunities for all TESOL members, NNES professionals started holding leading positions in the Association, such as members of the Board of Directors, editors of the journal TESOL Quarterly, and even president of the Association. Ten years later, the NNEST Interest Section replaced the Caucus. Apart from advocacy, the group’s activities included research on common professional issues. This event marks “the full recognition of NNEST issues as a field of research.” (Kamhi­Stein, 2016, 192). Some of the goals of the NNEST movement have been met. The goal of leadership development has been met. NNESTs have not only served in leading positions within the TESOL organization but also outside. For example, a former NNES Caucus chair served as President of the American Association for Applied Linguistics (AAAL). The goal of promoting the research and publications on NNESTs in the ESL and EFL fields has been accomplished. Several articles, book chapters, doctoral dissertations, and books related to the role of NNESTs in the English teaching field have been published in Asia, the Americas, and Europe. According to Kamhi­Stein (2016), the goal of creating networking opportunities for NNESTs has been partially met. Not all affiliates of the Association in the US (actually, only two) or affiliates abroad (in fact, only one: Mexico TESOL) have formally established an organization with similar goals as the NNEST Caucus. Also, not all English teaching professionals, either established or new teachers, are aware of the existence of a NNEST entity within the TESOL organization. More awareness­raising should be done, especially among novice teachers, so that they would feel more supported. A goal that definitely requires further action, Kamhi­Stein (2016) claims, is that of creating “a non­discriminatory professional environment for all TESOL International Association members regardless of native language and place of birth” (p. 186). In spite of anti­discriminatory practice resolutions published by TESOL International, CATESOL (representing English teachers in California and Nevada), and British Columbia Teachers of English as an Additional Language, current hiring decisions are still based on teacher ethnicity, as is reflected in the introduction to this paper. Kamhi­Stein (2016) argues that there should be strong campaigns educating on hiring practices, and on the relevance of both teacher language proficiency and professional qualifications, thus raising greater awareness that “teaching is a profession.” She also believes in promoting the notion of World Englishes, which acknowledges the “variation and cultural pluralism denoted by the term ‘Englishes’” (Kachru & Smith, 2008:4, as cited in Kamhi­Stein, 2016, p. 187). Kamhi­Stein (2016) concludes that “This is the unfinished business that needs to be tackled so that in 10 or 20 years from now, the NNEST movement will have succeeded and there will no longer be a need for it” (p.188). Arva, V. & Medgyes, P. (2000). Native and non­native teachers in the classroom. System, 28, 355­372. Bourdieu, P., & Thompson, J. B. (1991). Language and symbolic power. Cambridge, MA: Harvard University Press. Holliday, A. (2006, October). Native­ Speakerism. ELT Journal, 60(4),385­-387. Kamchi­-Stein, L.D. (2016). The non­native English speaker teachers in TESOL movement. ELT Journal , 70(2) , 180-189 . Levis, J., Link, S., Barriuso, T.A. (2016). Native and Nonnative Teachers of L2 Pronunciation: Effectson Learner Performance. TESOLQuarterly. Lowe, R.J. & Pinner, R. (2016). Finding the connection between native­speakerism and authenticity. Applied Linguistics Review, 7(1), 27-­ 52 . Ma, L.P.F. (2012). Strengths and weaknesses of NESTs and NNESTs: Perceptions of NNESTs in HongKong. Linguistics and Education, 23, 1­-15. Mahboob, A. (2009). Racism in the ELT industry. In A. Mahboob & C. Lapovsky (Eds.) Studies in Applied Linguistics and Language Learning. Newcastle upon Tyne: Cambridge Scholars Press. Phillipson, R. (1992). Linguistic Imperialism. Oxford: O xford University Press. Todd, R.W. & Pojanapunya, P. (2009). Implicit attitudes towards native and non­native speakerteachers. System, 37, 23­-33. Vertovec, S. (2007). Super­diversity and its implications. E thnic and Racial Studies, 30(6), 1024­1054. Walkinshaw, I. & Oanh, D.H. (2014). Native and Non­Native English Language Teachers: Student Perceptions in Vietnam and Japan. SAGE Open. Don’t Call Me Hispanic; I’m Cuban! ‘Hispanic,' as discussed by G. Cristina Mora, becomes a loaded word. In the recent years, we’ve come to know ‘Hispanic’ as an umbrella term, one that conglomerates all south and central Americans into one slot, simultaneously giving them a set of common ways-of-being in the social world. In other words, Hispanics, in the eyes of those who are not, share an ambiguous, yet ‘familiar’ identity that makes them ethnically equal. The ubiquity of such term in the United States’ media, market, and political discourses, then, raises interesting questions, mainly, the one which asks about Latin@ identity within the Latin@ community. Are all ‘Hispanics,' i.e., a Cuban-born businessman in Miami, an undocumented Mexican farm worker in California, and a third-generation part-Puerto Rican in New York, all the same? There is certainly many linguistic commonalities, but is that enough? Mora, a trained sociologist, tackles the term to argue that it is a historically constructed identity with an obvious political and consumerist agenda. To do this, Mora first spells out the historical developments that birthed Hispanicty; from its very beginnings in 1960’s through its stabilization in the 1980’s (establishment of the Hispanic category by the Census Bureau), Mora doesn't leave anything out. Then, via some great archival research, retellings of complex oral histories, and interviews, she reveals the complexities, and the why’s and how’s of its creation in the United States. Making Hispanic is divided into four extensive chapters. Each of them corresponds to a particular organization and how it has helped shape and establish Hispanic panethnicity. Overwhelming at first, each chapter is to be understood in relation to the others, as that is the only way one can, together with the author, dismantle Hispanicity’s common perceptions. What better way to deal with something so complex and varied than to minimize it to one small, ambiguous category? The demand for better data or broader classification is what, in fact, drove many of these institutions, more so the federal government, to want to ‘understand’ several ethnic groups as a larger conglomerate. Mora argues that in the 1960’s and early 1970’s the invisibility of the Latin@ community to federal government forced its officials to find a framework in which Latinos could be ‘better served.' 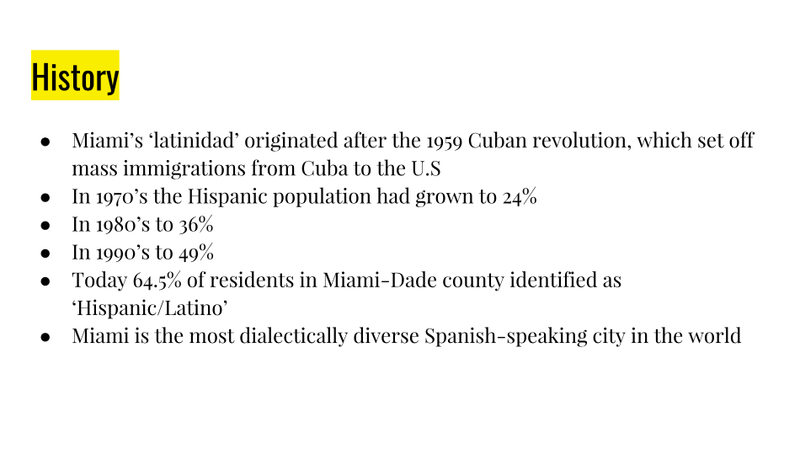 Consequently, the three largest Latino ethnicities in the U.S. (Cuban, Puerto Rican, and Mexican) were packed into one single framework, which, Mora argues, highlighted ambiguity, and, therefore, minimized the political agenda of such Latin@ groups fighting for social justice during the civil rights movement. Ambiguous or not, this condensed framework institutionalized Hispanic panethnicity to enforce Latino mobility in this country. The early efforts to cram all three major Latino groups led to the foundation of the Council of La Raza (NCLR), which was formerly known as a Chicano advocacy organization (now a corporation); it became a powerful organization that served three major Latin@ ethnicities. The quest for unifying the Latin@ community, of course, rose through the acknowledgment of the fact that each Latin@ ethnicity shares linguistic elements. To respond to the needs of the three largest Latin@ groups in the 1960’s and 70’s, the U.S Census Bureau implemented various categories that utilized regionality to measure the ‘Spanish-Speaking’ population. Ultimately, the Census Bureau implemented the ‘Hispanic origin’ question in 1980. Americans were now being asked whether or not they were “Hispanic” separately from whether they were white, black, Asian, or Indian. This transgression served as a potent illustration of the negotiations between organizations like NCLR and the government, as the Latin@s searched for a greater support when it came to education, funding, etc. Similarly, mass media also underwent a significant shift in the way Latin@ were represented and sold to. Media giants, like Univision and Telemundo, were, too, interested in catering and selling to a simplified audience, and, therefore, established a somewhat malleable Hispanic aesthetic within their network (it is safe to say that programming was, and still is, ethnic-centric). With the help of newly acquired data from 1980 Census, media stations got to work and developed a new, ‘more informed’ Hispanic sound, look and vocabulary. Although thorough, Mora’s exploration of the socially constructed ‘Hispanic’ is no more than just that, a history and analysis of Hispanic panethnicity. Her project might've benefited from cross-group comparisons, as that would've amounted to bigger findings. For instance, comparing the developments of Hispanic panethnicity to that of Asian Americans’ identity could've been a useful and exciting task. Comparisons like this would inform the public, and other scholars alike, about the developments and outcomes of group formation, processes beyond Hispanic identity construction.